This recipe is fantastic! It is easy, prepares in 30 min or less and is so flavorful. The aroma of the roasted fresh tomatoes and herbs will make your mouth water, It is a very light dish and mainly vegetarian but you can kick this recipe with some prosciutto or bacon for the meat lovers. Cooking in Brazil, I would roast Roma tomatoes cut into quarters but I substituted to grape or cherry tomatoes. They are sweeter and it saves a step! 2) Cook pasta according to pkg directions, drain and set aside. 3) Place tomatoes in a rectangular Pyrex dish. Drizzle about 1/4 cup extra virgin olive oil, sprinkle herbs the Provence and salt and pepper to taste. Make sure all tomatoes are well coded with oil and herbs. Set in oven for 20 min. 4) When tomatoes are ready, place pasta in to a large elegant bowl, add the tomatoes with herbs and all the liquid that formed, add a bunch of fresh basil, Asiago cheese and gently toss. 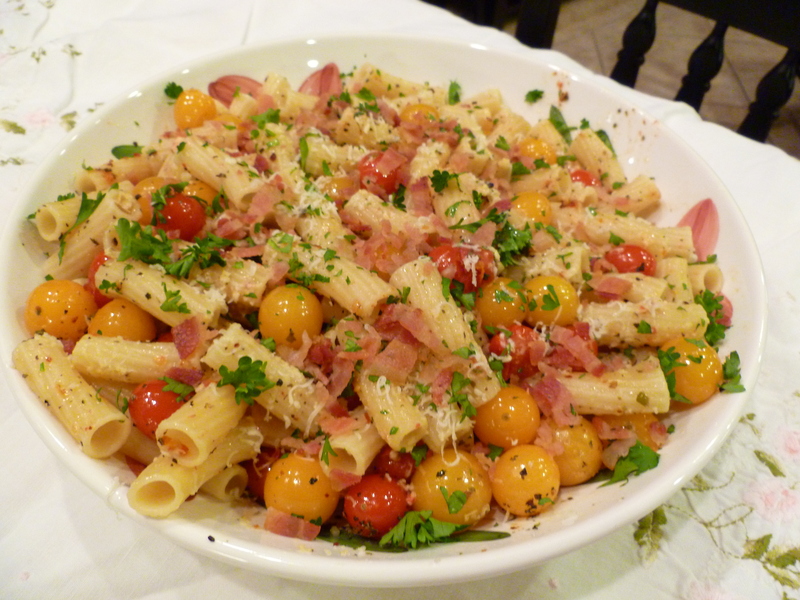 5) Garnish with more fresh basil and and prosciutto or bacon if using them. * Prosciutto is Italian bacon it is not smoked but you can use regular smoked bacon or even turkey bacon.